Pumpkin and chocolate are such a good combination in a dessert, especially in an icebox cake, or do you call it Eclair Cake? We were having company last weekend, and I wanted to make a seasonal dessert. 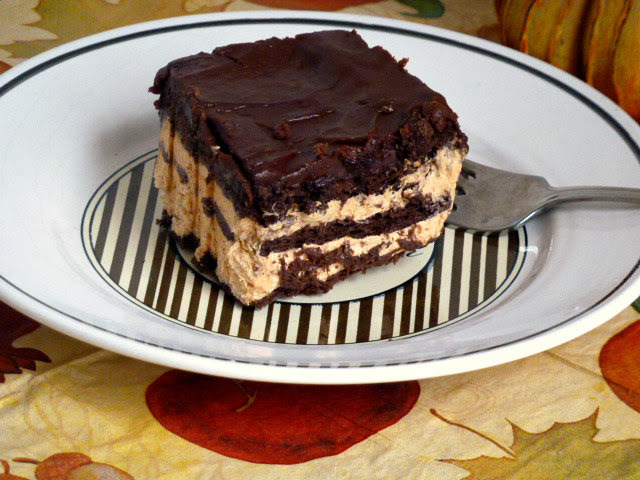 I had seen an Eclair Cake on Pinterest using chocolate graham crackers. I have made many Eclair Cakes in mny day, but never with chocolate graham crackers. I had to go to several stores to find them, but I did succeed. These chocolate graham crackers aren't the chocolate covered ones, just plain chocolate graham crackers. I then added pumpkin to the vanilla pudding mix and whipped topping, to get a pumpkin mousse like filling. So I decided to name this Icebox Cake, because of the pumpkin filling. I topped the dessert with my go to Chocolate Frosting. This dessert is so easy to make and so good to eat. You can also use regular graham crackers, if you wish. I know there are those of you that don't care for chocolate. This dessert can also be made days or a week ahead of time, and then frozen. My hubby likes to eat it frozen. You can also use canned frosting to make this dessert even easier. Pumpkin Chocolate Icebox Cake would make a great addition to your Thanksgiving dessert menu. Enjoy! Arrange a single layer of graham cracker squares in the bottom of an 8x8 inch baking pan. Evenly spread half of the pudding mixture over the crackers. Top with another layer of crackers and the remaining pudding mixture. Top with a final layer of graham crackers. You may have to break the crackers to get them to fit the pan. Spread the frosting over the whole cake up to the edges of the pan. Cover, and chill overnight. May also be frozen. Put powdered sugar in a large mixing bowl. In a small sauce pan combine. Butter, cocoa, and milk Heat until mixtures comes to just a boil, stirring constantly. Be careful not to let it scorch. Pour mixture over powdered sugar and beat until smooth with an electric mixer. Pour over graham crackers. Becky, I love your festive variation and the pumpkin/chocolate combination pairs wonderfully! Better yet, a dessert which can be done in advance (and doled out as desired) makes living easy. Who doesn't like easy? Nice work, my dear. Pumpkin and chocolate, oh my gosh! It sounds delicious, Becky! Whatever you call it, I want to make it. The ground is white here and still snowing. Good grief! Cranberry Bliss Bars in my new Calphalon Pan!